A dramatic lower-order collapse against Kings XI Punjab exposed Delhi's batting frailties and Iyer would look to plug those holes to stand a chance of taming Sunrisers, who have been on a roll with back-to-back wins. A new look Delhi made a rampaging start to the season with a superb win over three-time former champions Mumbai Indians but since then they have struggled with their lower-order. Delhi are currently fifth in the standings with two wins and as many losses after four games and consistency is something which they would be looking for. Delhi had failed to score six runs from the last over against Kolkata Knight Riders, thus taking the match to Super Over and it was only due to Kagiso Rabada's superb yorkers, they had managed to scrape through in the end. However, Delhi's lower-order came unstuck against Kings XI on Monday night when they inexplicably lost seven wickets for eight runs to lose the game by 14 runs. Delhi were 144 for three in the 17th over, chasing 167 before being bowled out for 152 in 19.2 overs. "I am really speechless. Really disappointing. It is a crucial match and losing such matches is not going to benefit us. Mentally we need to train ourselves - we are getting good starts, need to finish better," Iyer had said. The bowling department has been led by Rabada, while they also have Kiwi pacer Trent Boult and Ishant Sharma in their ranks. Young Nepal leg-spinner Sandeep Lamichhane too has performed well so far for Delhi. But the real contest on Thursday would be between Delhi pacers Rabada and Chris Morris against the marauding Sunrisers pair of David Warner and Jonny Bairstow. The pair of Warner and Bairstow have been in scintillating form this year, sharing century-plus opening stands in all their three matches so far. 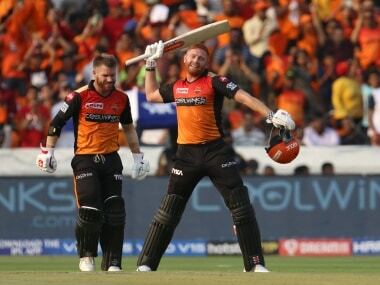 After a 118-run opening stand against KKR in a losing cause, Warner and Bairstow continued their dominance up the order with 110-run and 185-run partnerships against Rajasthan and Royal Challengers Bangalore. In fact, both Warner (100 not out) and Bairstow (114) blasted a century each during Sunrisers massive 118-run win over RCB in the last game. On road to redemption, Warner has looked ominous as he blasted 69 off 37 balls against Rajasthan, before a whirlwind 55-ball unbeaten 100 blew away RCB. Besides, he started the season with a 85-run knock against KKR. 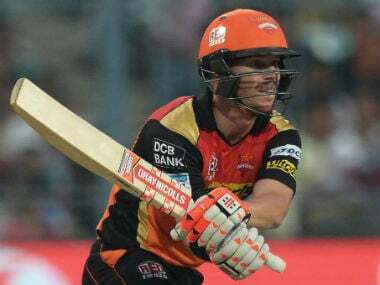 After the six-wicket defeat to KKR in their opener, Sunrisers roared their way back into the tournament, largely riding on Warner and Bairstow's exploits and come Thursday, they would be eyeing a hat-trick of wins. Among Sunrisers' bowlers, Afghanistan spin duo of Mohammad Nabi and Rashid Khan would look to do the maximum damage, while pacer Sandeep Sharma too has done well with four wickets. But Bhuvneshwar Kumar's performance, especially at the death, has been a major concern for Sunrisers. 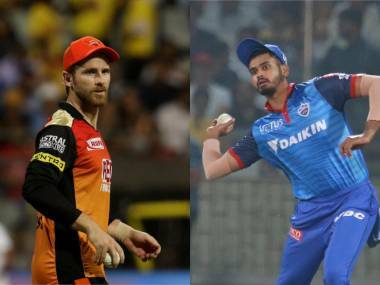 SunRisers Hyderabad: David Warner, Jonny Bairstow, Manish Pandey, Deepak Hooda, Shakib Al Hasan, Vijay Shankar, Yusuf Pathan, Rashid Khan, Bhuvneshwar Kumar (capt), Sandeep Sharma, Siddarth Kaul, Kane Williamson, Martin Guptill, Ricky Bhui, Shreevats Goswami, Wriddhiman Saha, Shahbaz Nadeem, Mohammad Nabi, Abhishek Sharma, Basil Thampi, Billy Stanlake. Delhi Capitals: Shreyas Iyer (capt), Colin Munro, Prithvi Shaw, Shikhar Dhawan, Hanuma Vihari, Colin Ingram, Manjot Kalra, Chris Morris, Sherfane Rutherford, Keemo Paul, Axar Patel, Jalaj Saxena, Rahul Tewatia, Rishabh Pant, Ankush Bains, Sandeep Lamichhane, Avesh Khan, Harshal Patel, Trent Boult, Amit Mishra, Kagiso Rabada, Ishant Sharma, Nathu Singh, Bandaru Ayyappa. The match starts at 8 pm (IST).